In San Antonio we routinely get 5 down. These days I am experiencing 3 and 4 on the computer. Videos don't want to load, neither does anything else much, and WiFi is slower on tablet too.. Anyone have an inside line to TelMex to know what's going on? Friend out in the country is having same problem. In the village I get 1.7 and you think your internet is slow! Okay ladies. 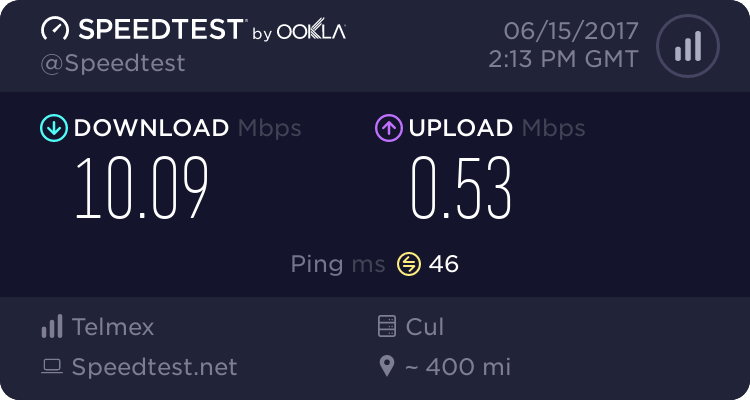 I had the most miserable connection for the internet for nearly 7 months. Telmex did nothing. They do not maintain their infrastructure and are too flippin' lazy to actually climb up a pole to check connections at the junction boxes. Finally I called Jose Luis Gonzalez who USED to work for Telmex. He was recommended by friends in Joco. I had a totally corroded connection up a pole around the corner from my house. Took him 15 minutes to find the problem and 15 minutes to fix it... cost 300 pesos. 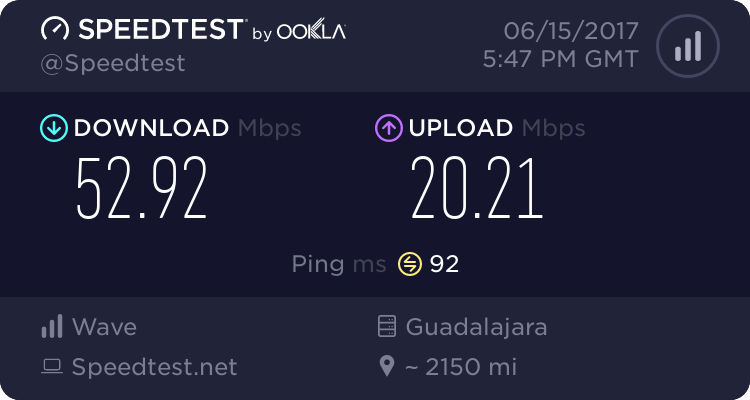 And, I've had a rock solid steady connection with 10 down and 1 up for several months now, on the 599 plan, and in Riberas. And I seriously hope that I haven't jinxed myself by giving out this information. Knock on wood. ferret, I do not know if it is true but telmex told me the downloads in Riberas was way better bevause they are on another system..Meanwhile they also told me the equipment for Ajijic was in San ANtonio and that people on the east side of Ajijic were getting better downloads..
TI am going to call Mexico tomorrow morning and also call Luis . THanks Ferret. He's worth a try Brigitte and he's a very nice man. imho, the only thing that the local Telmex office is good at is flapping their lips and making excuses. Suerte! Yes, thank you Ferret. I will talk to TM too then Luis. It's true, you get the same speed no matter how much you pay. Trailrunner wrote: In San Antonio we routinely get 5 down. These days I am experiencing 3 and 4 on the computer. Videos don't want to load, neither does anything else much, and WiFi is slower on tablet too.. Anyone have an inside line to TelMex to know what's going on? Friend out in the country is having same problem. Did it start happening after the rains? Have you checked to see what any of your neighbors are getting? Yes, after the rains, no haven't checked with neighbors, most don't have internet but a couple do. The SAT fiesta is just no over but that shouldn't have anything to do with it, right? Currently: 4.87 Down and .49 up which is now closer to normal. Trailrunner wrote: Yes, thank you Ferret. I will talk to TM too then Luis. That has not been the case for me. When I moved into this house, it was on the 389 plan and I was getting 5 down and about 0.5 up. I brought my laptop with me to check the connection before I bought it as well. Within a month, I changed to the 599 plan and was getting 10 down and 1 up. Then I started to have problems which have now been resolved. Knock on wood. My neighbour, who is in the same junction box, also had his connection fixed by Luis. Same problem, corroded wires. And, he stated that there were other connections in the box with the same problem. Just wires twisted together with no black tape or marrettes to protect the connection... in a box that is not sealed from the elements. In other words, a recipe for disaster. How does someone not w/T.M. get into a junction box? Sure wish they would brin cable to Chapala Haciendas. We're not talking about the big green junction boxes on the ground. We're talking about the little plastic boxes at the top of a pole that don't even close properly. If they were a little big bigger, they'd probably have birds nesting in them. Twits. Very nice. I have the $399 package and always test around 10 MBPS for download. My upload speed is pathetic. ferret wrote: Okay ladies. I had the most miserable connection for the internet for nearly 7 months. Telmex did nothing. They do not maintain their infrastructure and are too flippin' lazy to actually climb up a pole to check connections at the junction boxes. Thanks for the tip, Ferret. My internet speed was so slow for so long. When the rains started I began getting outages from a couple of minutes to a couple of hours. Then, it started going down more often than it was up. After reading your post I called my go-to guy. He went up on my roof and found several issues that he fixed using nothing more than electrical tape and pliers. Internet has been on ever since and speed is much improved. And your point is . . .? I should go to Seattle? Not a chance.